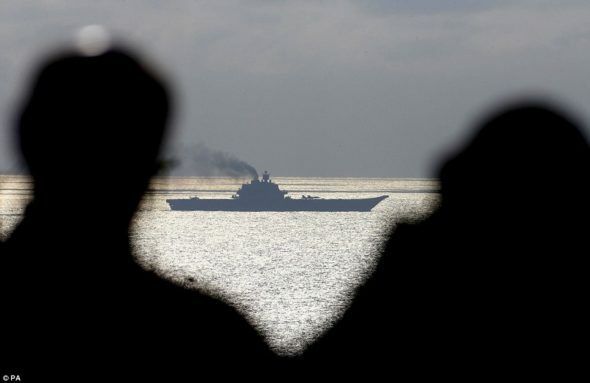 (UK Sky News) – A convoy of Russian warships heading for the Mediterranean sailed down the English Channel on Friday – “marked every inch of the way” by the Royal Navy. 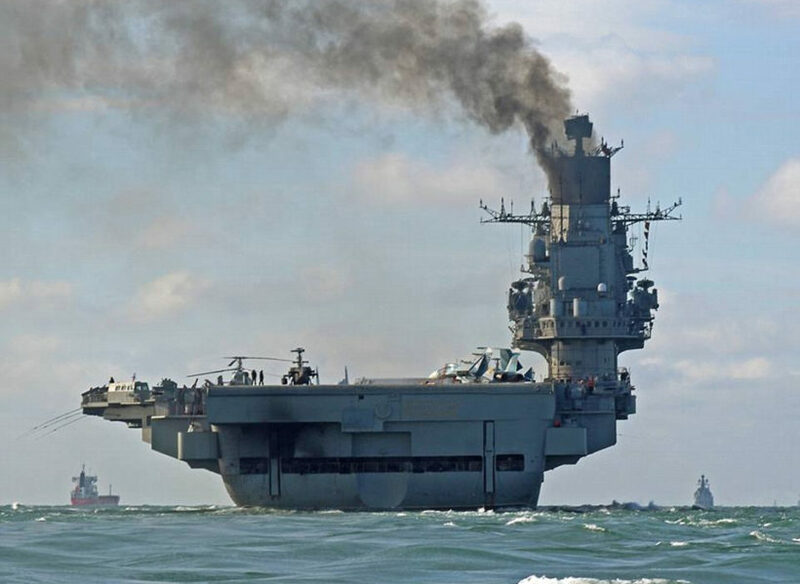 Video footage showed the Russian task force, including Russia’s only aircraft carrier Admiral Kuznetsov [which can hold as many as 40 planes] off the coast of Dover. The fleet also reportedly includes the Pyotr Velikiy battlecruiser, the Severomorsk anti-submarine ship, the Vice-Admiral Kulakov destroyer and other support vessels. 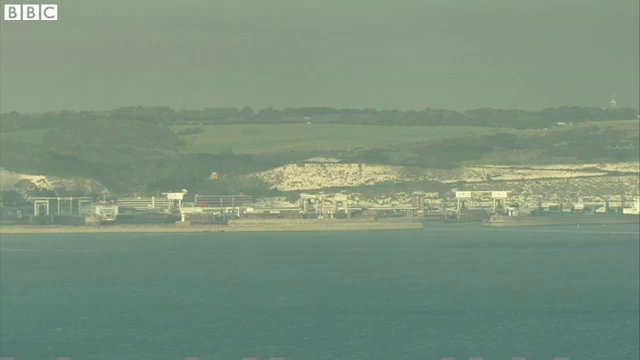 The most sensitive part of the fleet’s journey was through the English Channel’s narrowest point at the Strait of Dover [which is 20 miles wide]. Vladimir Putin’s armed flotilla [fleet of ships] is believed to be heading to Syria to support Russia’s military operations in the war-torn country. …British ships, including two destroyers – HMS Duncan and HMS Dragon – were deployed earlier this week and have been monitoring the Russian vessels. The Russian fleet, which has been heading south from the Norwegian Sea, has also been escorted by British frigates [warships] HMS Richmond and HMS Duncan. Britain’s Defense Secretary Sir Michael Fallon said the Russian naval deployment was aimed at “testing” British capabilities. “The Russian fleet that is now sailing from the north, presumably down into the Mediterranean, is clearly designed to test the alliance. It’s being marked every step of the way by the Royal Navy and ships and planes of other NATO members as well. Shadowing ships is a regular task for the Royal Navy, which has been supported by Royal Air Force surveillance aircraft this time, it is understood. Images of the Russian convoy, taken from a North Sea oil rig, also show the fleet being shadowed by a NATO Hercules C-130. It is feared the powerful force could soon join in attacks on Syria’s besieged city of Aleppo. A NATO official said: “Russia has the right to operate in international waters. There are plans in place for NATO navies to monitor the Russian ships as they head for the Mediterranean. According to the Russian news agency Tass, Russia’s Defense Minister Sergei Shoigu told a meeting in September the plan was to bolster the “combat capabilities” of the country’s Mediterranean fleet. (Associated Press) – SEOUL — South Korea’s president on Monday proposed revising the country’s constitution, which currently limits the president to a single five-year term. Critics immediately called it an attempt to divert attention from corruption scandals involving her associates. President Park Geun-hye’s office said there was no possibility that she would use the constitutional amendment to extend her rule or run for office again. Park pledged during her presidential campaign four years ago to try to change the system. South Korea adopted the current system in 1987, ending decades of military-backed dictatorships, including one by Park’s father, Park Chung-hee. Under the current system, a president is barred by law from seeking a second term. Park’s five-year term ends in early 2018. Park said in a speech before parliament that the current system makes it difficult for the government to maintain a continuity of its policies, including those dealing with rival North Korea, which regularly threatens nuclear war against its southern rival. Park said her government would launch an organization to create a draft revision. Park’s proposal came as her approval ratings have dropped to new lows amid allegations that a purported longtime confidant used her connection to Park to push companies to make massive contributions to set up two non-profit foundations. Park has also faced a separate corruption scandal involving a senior aide. The main liberal opposition party issued a statement criticizing Park’s proposal, saying it won’t take part in any discussions on a constitutional change that appears meant to distract from the scandals. “What matters is the timing. Why does President Park propose a constitutional change at a time when she faces so many problems (involving her associates)?” said Kim Sung-Joo, an honorary professor at Seoul’s Sungkyunkwan University. Talk of amending [make changes to] the constitution is a divisive issue in South Korea. There are camps that favor a parliamentary Cabinet system or a U.S.-style system in which a president can have a second four-year term, or a system in which a president and a prime minister split key state responsibilities. 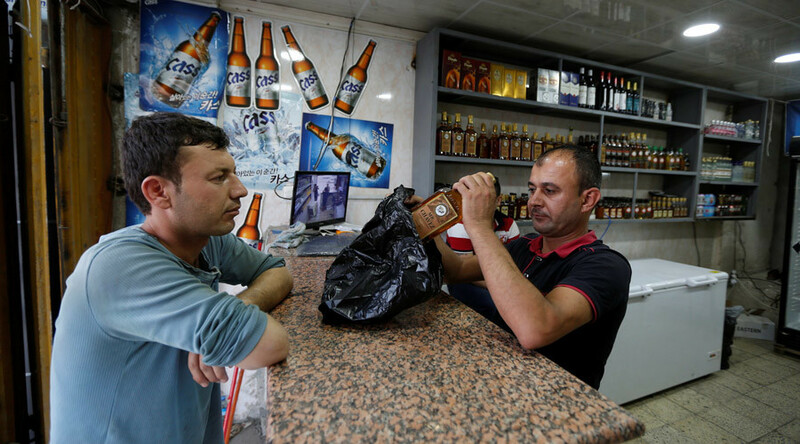 (Reuters) – Iraq’s parliament voted on Saturday to ban alcoholic beverages, lawmakers said, a move that worried Iraqis who see the growing influence of religious parties a threat to freedoms. Iraq’s population is predominantly Shi’ite Muslim, and its society is conservative, with many women wearing the black head-to-toe abaya and most people eschewing [avoiding; abstaining from] alcohol, which is forbidden by Islam. But alcohol is readily available in dozens of shops, bars and hotels around Baghdad and in some provinces. Though drinking in public is not prohibited, it is frowned upon. In Baghdad, it is not unusual to see youths drinking on the banks of the Tigris. The proposed alcohol ban is part of a bill on financing municipalities. “Forbidding the import, manufacture and sell of all kinds of alcohol drinks,” the bill said. “This law is necessary to preserve Iraq’s identity as a Muslim country,” said Mahmoud al-Hassan, a Shi’ite lawmaker and head of the legal panel of parliament. But MP Yonadim Kenna, from Iraq’s Christian minority, said the ban would run against the constitution and that he would refer the case to the federal court. “The decision gives a negative picture on what is supposed to be democratic Iraq. It’s a violation to the freedoms of all, not a certain group,” said Kenna. Some Iraqis worry Iraq will become a religious state, like neighboring Iran. “It’s obvious that religious parties are pushing Iraq to go the way of neighboring Shi’ite Iran, and install a religious theocracy [a country ruled by religious leaders and laws],” said Daniel Numan, an Iraqi human rights activist. Like Syria, Lebanon, Iran and other countries in the region, Iraq used to produce arak, a clear, anise-flavored liquor which turns milky when mixed with water. But most arak factories have closed down, notably in the northern town of Bashiqa, close to Mosul. Iraqi Kurdish fighters said on Sunday they had captured Bashiqa from Islamic State. Iraqi troops, helped by Shi’ite and Kurdish fighters, as well as U.S. forces, are waging an offensive to take Mosul back from the control of Islamic State. b) What was the Russian flotilla’s destination? c) How does the UK view Russia’s choice of route? d) What is the NATO reaction to the Russian flotilla? e) Read the “Background” below. To what motive do the experts quoted here attribute Russia’s trip through the English Channel? Be specific. 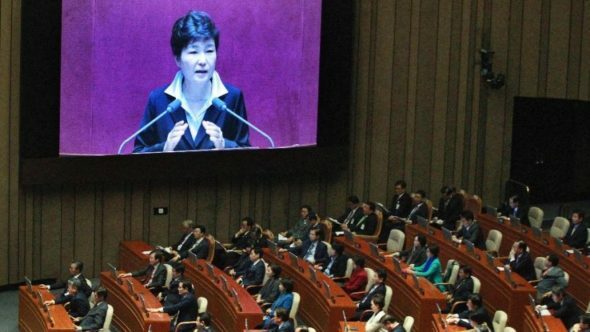 b) For what reason do critics say President Park is proposing the amendment? c) How did President Park explain her proposed change in term limits? d) U.S. Republican presidential nominee Donald Trump says he will propose establishing term limits for U.S. Congress. Ask a parent: would you support a constitutional amendment to implement term limits on U.S. Senators and Representatives? Please explain your answer. c) Why did the Iraqi parliament pass the law? d) How does Islam view alcohol? 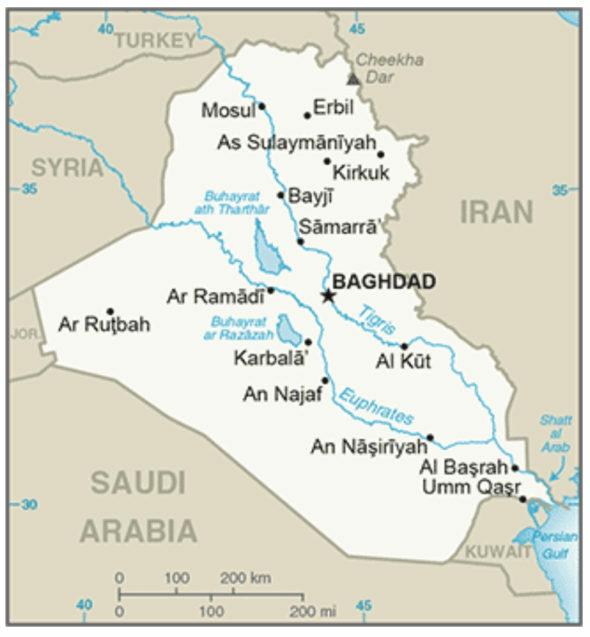 What is the current practice in Iraq? 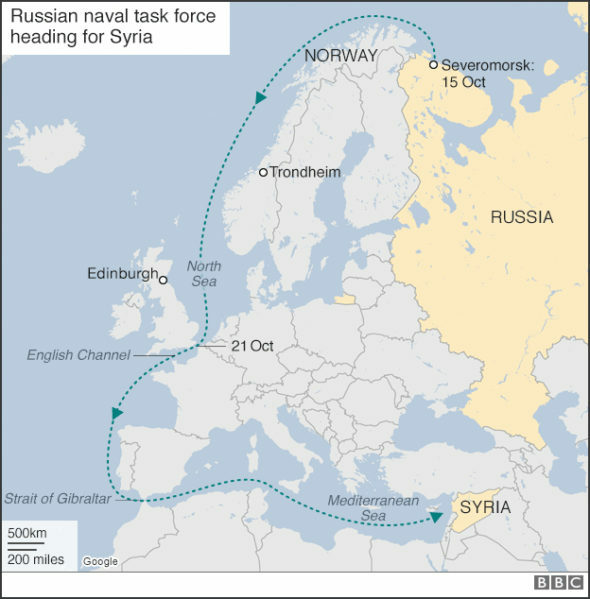 It is routine for Britain’s Royal Navy to shadow ships, but the route taken by the Russian convoy — through the English Channel [international waters between Britain and France] — was not routine.